My Woods "bush hog" is mounted on the back and is stuck in the up position. Can't seem to get it down no matter what I try. Is there a way to release the pressure in the hydraulic line and will that lower the mower? Once the pressure has been released, do I need to do anything to get the PTO's up/down operation working properly again? I'm not much of a mechanic, so the simplest fix is best for me. A PTO is the drive system--power take off. You mean the 3 point hitch won't move. Check any linkages going to/from the 3pt hitch control lever that may have come loose. If you don't have the manual for it (which you should have), there's likely a stop or control valve for the hitch. When closed (turned in or clockwise) it holds the hitch from lowering, and should be opened enough to let the hitch lower at the speed you want when the lowering control is down. If there is one and you find it, try opening it. I have a 7284 from 2005 that is in great shape but has been sitting 12 months at least and the arms worked originally but have now stuck in the up position. I checked the manual and the seat area and cannot find a release knob/control.The lever controlling the height seems loose, a bit but all the connections appear to be in place. Can anyone help?? Do you have a mid mower deck on it? Does it go up and down? Is the mower deck pinned and locked in the up position? Not sure where the control knob is on your unit, but the 3 PH control knob has to be reachable when sitting on the tractor. No mid mower deck on this tractor. There is nothing attached to the rear lift arms. They are just stuck in the highest position. So far I cant find a control knob on this model. There is no control knob visible or mentioned in the manual. trying adding more hydraulic fluid tonight - maybe???? There is no control knob on that model tractor. Your tractor has what is called draft control. The position of 3ph lever determines the height of the 3ph arms. I would start by cleaning up all joint areas and lubricating all linkages. I would set the 3ph lever to the full down position and stand and bounce on the hitch with a draw bar in the arms to see if I could free it. Thanks I will try that tonight. 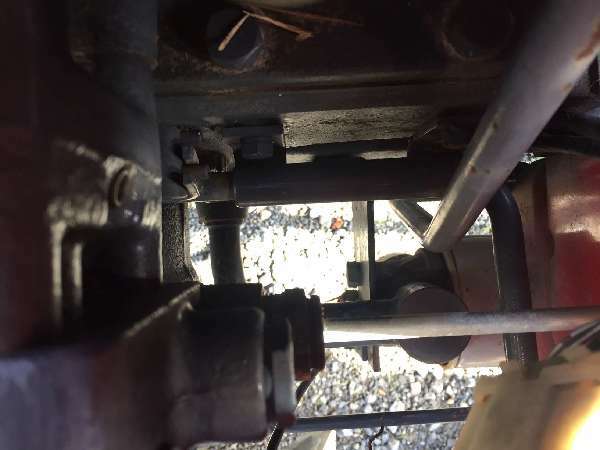 the 3PH lever seems loose which made me think it was a mechanical issue as opposed to hydraulic but I cant see anything unconnected under the fender - its not the easiest of access points.